Recently, the Second Session of the 13th National People's Congress of Guangxi Zhuang Autonomous Region was held in Nanning. Chen Wu, Chairman of Guangxi Zhuang Autonomous Region, and Wang Xiaodong, Member of the Standing Committee of the CPC Guangxi Committee and Secretary of the CPC Nanning Municipal Committee, joined in the Nanning delegation to review the work report of the People’s Government of Guangxi Zhuang Autonomous Region with the other attendees. Chen extended his wishes that Nanning would firmly establish and practice new development concepts, grasp the development opportunities, conscientiously implement the strong capital strategy, and build a core growth pole for the development of the region in accordance with the overall goal and requirements of “Building Magnificent and Beautiful Guangxi to Jointly Achieve China’s Rejuvenation”. 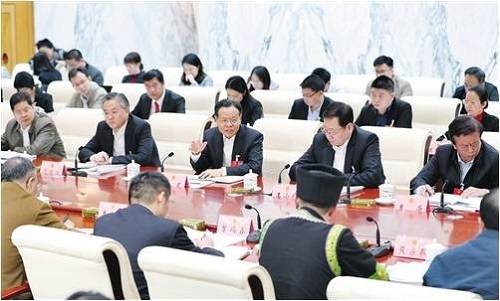 During the review, representatives including Wang Xiaodong and Zhou Hongbo made speeches in succession and expressed their support for the work report of the People’s Government of Guangxi Zhuang Autonomous Region. They believed that the report was truthful and pragmatic, and boosted the spirit. Focusing on the development goals and overall deployment proposed by the report, the attendees aired their views freely based on the actual conditions of Nanning, and put forward opinions and suggestions for the construction of “Headquarter Economy” base, the industry layout of emerging industry, the deepening of Reform and Opening-up, the ecological environment construction, etc.